Stewart, E. M., Fabretto, M., Mueller, M., Molino, P. J., Griesser, H. J., Short, R. D. & Wallace, G. G. (2013). Cell attachment and proliferation on high conductivity PEDOT-glycol composites produced by vapour phase polymerisation. Biomaterials Science, 1 (4), 368-378. High conductivity poly(3,4-ethylene dioxythiophene) (PEDOT) was synthesised using vacuum vapour phase polymerization (VVPP). The process produces PEDOT composites which incorporate glycol within the polymer. To assess biocompatibility, a suite of analytical techniques were utilised in an effort to characterise the level of glycol present and its impact on cell attachment and proliferation. A small decrease in fibroblast cell attachment and proliferation was observed with increasing glycol content within the PEDOT composite. Keratinocyte cell attachment and proliferation by comparison showed an increase. 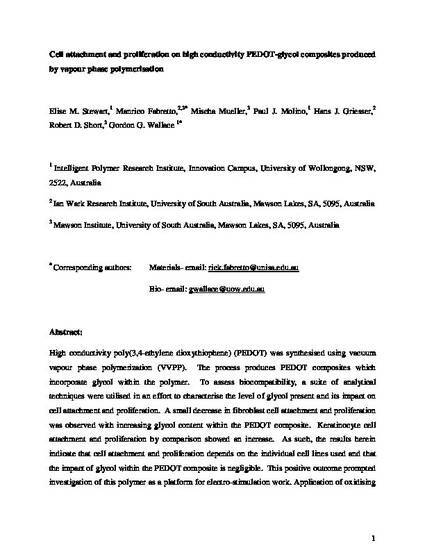 As such, the results herein indicate that cell attachment and proliferation depends on the individual cell lines used and that the impact of glycol within the PEDOT composite is negligible. This positive outcome prompted investigation of this polymer as a platform for electro-stimulation work. Application of oxidising and reducing potentials to the PEDOT composite were utilised to examine the effect on biocompatibility. Significant effects were seen with altered protein presentation on the reduced surface, and lower mass adsorbed at the oxidised surface. Keratinocytes interacted significantly better on the reduced surface whereas fibroblasts displayed dependence on protein density, with significantly lower spreading on the oxidised surface. Understanding how proteins interact at electrically biased polymer surfaces and in turn affect cell behaviour, underpins the utilisation of such tunable surfaces in biomedical devices.